I always believe, and preach, that it’s unfair to review a perfume unless you wear it…in decent quantity. You can’t judge a perfume from a scent strip, spraying it on paper, or dabbing a drop or two (Pilgrim-like) on your wrists. When I test a fragrance, I spray it liberally on my chest and arms. So: I hereby admit I’m reviewing the new Paco Rabanne Invictus1 based only on a couple of sprays aimed at the back of one hand (where I can “easily” scrub it away as soon as I'm convinced it has delivered its full “personality”). The thought of dousing myself with Invictus is repellant! Invictus starts with sweet 'n sour fruit aromas; the fruit has a furry edge (decomposition? or funky bay leaf?) Invictus' sweetness builds as very cheap-smelling indistinct floral notes emerge and are joined by a marine "bilge water" accent. The overall tone of Invictus is "sporty"/locker-room-in-high-school (with smelly air pockets of menthol, scented deodorant and mouthwash). Near the end of its development, there's burnt musk. Invictus smells inexpensive but lasts and lasts on skin; unfortunately, the sillage is excellent. I find the Invictus bottle "adolescent" in character...but that's just my taste/take. I wonder if Invictus was designed to attract the post-Axe crowd? Young men who realize Axe scents are too "teen" for them, but who hate the idea of giving up those "fresh" marine/ozone/sport notes. Now: off to scour my hand! 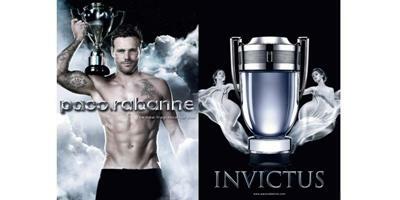 Paco Rabanne Invictus is available in 50 and 100 ml Eau de Toilette. 1. Perfumer: Véronique Nyberg; fragrance notes for Invictus include grapefruit, marine accord, bay leaf, jasmine, hedione, guaiac wood, patchouli, oak moss and ambergris. “…or dabbing a drop or two (Pilgrim-like) on your wrists” – haha, I love it! Golly, apart from my sea sickness, apart from the fact that I am not a Calvinist, and apart from the fact hate the idea of always wearing black, I must be a pilgrim. I usually wear no more than a spray or two of fragrance, generally on my wrists. Dilana, ha! My body must eat perfume for fuel…one spray would never work. Thanks for the afternoon laugh! “Burnt musk,” eh? I cannot find words to describe how bad that commercial is. kindcrow: i bet you can find the words! They are just not rated for this site. Oakland: haha! Yes, I saw it…forgot to link it! Thanks. A new kid on the block here, I’ve benefitted from a number of your reviews as I try to get up to speed. Thank you. Today, however without trying to explain how, I took off reading this current review not having seen the author and assuming that it was Robin. After a slight hessitation, I reshaped my mental image of Robin and admited to myself that a man must never reallyi know a woman until he’s watched her test a new scent or two…. lol…. Me mistake was eventually discovered and Robin’s image reset. I did then go on to search your name and “Kouros” on NST and was very happy with what I read. …Thrown out of resturants indeed; it’s the only scent that I’ve ever *really* loved. I’m here without much perfume background to see if there is anything esle I should smell. It’s a new term to me, but it seems that I’m looking for my Holy Grail. Any suggestions for places to look; methodologies; Perfume Gods to pray to? David…afraid there are no shortcuts to your bachelor’s degree in perfumery…just smell every perfume you can get under your nose…and wear LOTS…that’s where samples come in. You could read my “50 Masculine Fragrances every perfumista should try…” post to see if anything sounds good? I’ve never found a Holy Grail scent…and am sure I never will…variety variety variety! As long as you don’t smell like Invictus, everything is forgiven around here, lol! But Kevin wrote this particular review. Well if you buy the fragrance the man may be able to afford a shirt. What is it about partially clad people that is supposed to sell the product? When Jennifer Aniston’s perfume was introduced they marketed it using picture of her partially clothed sitting on a rock in the middle of nowhere looking more like a war refugee than a TV or movie star. I didn’t know whether they were advertising a fragrance or raising money for UNICEF or the Red Cross. VMF: well, the guy has enough money for waxing and the gym…don’t worry about him! Clix, Anarchy, Excite, and Dark Temptation still smell good to me though, hah. Stew…I should have said I like certain Axe scents better than this…. Always love a review when you hate a scent, Kevin! So what *would* you recommend to the post-Axe crowd who isn’t quite ready to be adventurous with their scent? Put me on the spot won’t cha, MR? Ha! I would say…Monsieur Balmain…Bvlgari Aqva Pour Homme…Terre d’Hermes…certainly explore citrus-heavy fragrances…. Even the new formulation of Monsieur Balmain? Cb: yes…even though it is being reformulated again apparently. I found the cologne to not be as bad as your review. But hey different strokes for different folks and besides I never judge a cologne by another ones point of view to begin with. great noses behaind a scrap perfume…what is going on with perfumery the last years? Indeed cheap, nothing remarkable, ungly and idiot…. Or charged with punishment the scroll. Yay! I’m not the only one who thought of the poem when I saw the name of the perfume. Apparently, they set it to very dramatic music years ago. My mom used to sing the poem — in a silly manner, of course — to me when I was a kid. Post-Axe crowd, brilliant line which made me laugh! Really good review on the above, I must admit I think it is a top male fragrance.